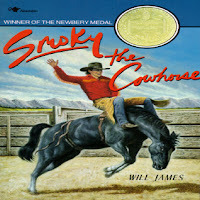 Smoky the Cow Horse by Will James is available at Amazon. Don't forget to check for a copy at your local library. Smoky knows only one way of life: freedom. Living on the open range, he is free to go where he wants and do what he wants. And being a smart colt, he learns what he must in order to survive. He can beat any enemy whether it be a rattlesnake or a hungry wolf. He is as much a part of the Wild West as it is of him, and Smokey can't imagine anything else. But then he comes across a new enemy, one that walks on two legs and makes funny sounds. Smoky can't beat this enemy like he has all the others. But does he really want to beat it? Or could giving up some of his freedom mean getting something else in return that's even more valuable? A long-winded story paying homage to a cowboy's horse. The plot isn't bad, it shows why animal rights are necessary, but the writing is a challenge. And it all comes down to dialect. This story attempts to preserve old western dialect with its incorrect grammar and lingo. At times, the dialect is endearing and nostalgic but, more often than not, it's frustrating because James forces the dialect. The edition I read had through spelled thru, tho for though, apelusa for Appaloosa and I think that's how the story was intended to be delivered. James used those spellings as often as possible; he created awkward sentence structures just so he could use them. This visual technique doesn't add to the old western dialect and pads the story with unnecessary words that could have been better used tugging on the readers' heartstrings.